Google has acquired the team behind JetPac, a startup that collects information from the photos that users post on their social network. The company JetPac has developed an app that will show the contextual search results from the index of social media posts. The financial deal of the acquisition was not disclosed by the company. 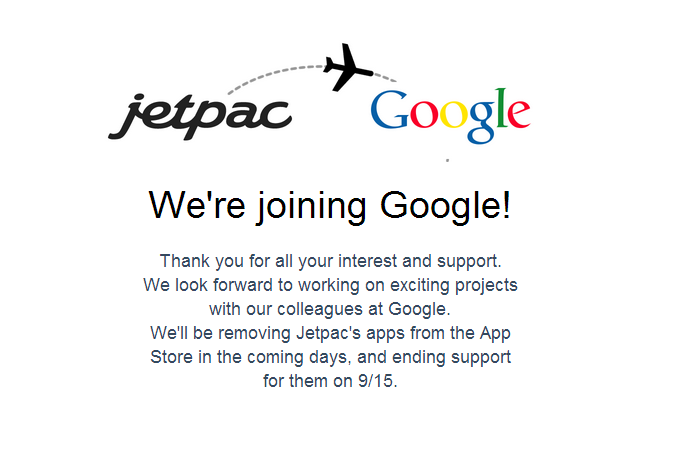 The app will be pulled from the App Store and support for the service will be discontinued on September 15. JetPac was founded in 2011 with headquarters in San Francisco. JetPac City Guides was a popular app made by JetPac team that analyzes photos collected by Instagram to generate city maps or guides. If any user searches for any place of his interest using the specific search term then the JetPac will give the specific results. JetPac uses the images used and shared by users on social media sites to give back relevant results. Its technology uses the artificial intelligence and machine learning research that allow the application to deliver better results to the specific location the user typed in. It is supposed that Google will use the JetPac brains to improve the search results around location information using images data. It could also be used in Google Plus, Google Now and Google Maps. JetPac has also built two iOS app, Deep Belief by Jetpac – teach your phone to recognize any object and Spotter by JetPac – Object Recognition Real-Time. “The app helps you to teach the phone to recognize an object by taking a short video of that object, and then teach it what is not the object, by taking a short video of everything around, except that object. Then you can scan your surroundings with your phone camera, and it will detect when you are pointing at the object which you taught it to recognize. We trained our Deep Belief Convoluted Neural Network on a million photos, and like a brain, it learned concepts of textures, shapes and patterns, and combining those to recognize objects. It includes an easily-trainable top layer so you can recognize the objects that you are interested in.”, the App Store description for its Deep Belief app reads.